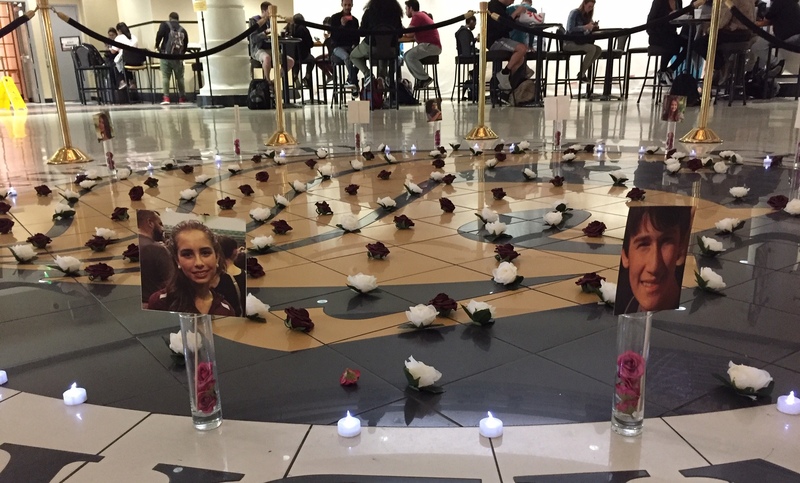 A candlelight vigil in the Student Union in February honors the victims of the Stoneman Douglas High School shooting in Parkland. Photo by Rahma Hassan. Claims of crisis actors and hoaxes prevent survivors and communities from healing after traumatic events such as Parkland, Sandy Hook and the separation of immigrant children from family members at the southern border, according to a study. The researchers studied the consequences of calling Parkland students, Sandy Hook parents and immigrant children separated at the border from their families crisis actors and the events they went through hoaxes. They argue that these claims impede discourse of renewal, a theory in crisis communication that encourages learning from crises. “Renewal discourse inspires a prospective vision for ethical change based on the lessons learned from a crisis,” according to the study. The researchers say they were led to conduct this study after monitoring the social media coverage of last year’s mass shooting at Marjory Stoneman Douglas High School in Parkland that left 17 dead. People online were “very critical of the students, even to the point of denying the crisis itself had actually occurred,” Sellnow said. Immigrant children separated from their families at the southern border were, too, on the receiving end of hoax claims. In June, conservative commentator Ann Coulter called these children “child actors” meant to put pressure on President Donald Trump to abandon his zero-tolerance immigration policy. “Do not fall for it, Mr. President,” Coulter said at the time. Five years earlier, after the mass shooting that took 26 lives at Sandy Hook Elementary School in Newtown, Connecticut, Alex Jones, a far-right commentator and founder of conspiracy theory website Infowars, claimed that the massacre was a hoax used to push gun control legislation. It was reported last week that Mark Richardson, a National Rifle Association official, enlisted the help of Wolfgang Halbig, a Sandy Hook hoaxer, to question the veracity of the Parkland shooting. Richardson wrote to Halbig saying “Just like [Sandy Hook], there is so much more to this story,” according to emails obtained by HuffPost. Since March 22, two Parkland survivors, Sydney Aiello and Calvin Desir, and a Sandy Hook victim’s father, Jeremy Richman, were reported to have died of apparent suicide. The researchers say that the first step toward healing is “recognizing the potential for such claims to do harm, particularly to innocent victims.” They add that companies must practice corporate social responsibility and deny conspiracy theorists access to their platforms, as many have already dropped Jones. If anyone is having suicidal thoughts or feels like harming themselves they can call the National Suicide Prevention Lifeline at 800-273-8255 or text TALK to 741741.